When the 50th anniversary of the capture of the USS Pueblo hit a few weeks ago, the nation’s eyes briefly returned to this forgotten American spy ship that had been captured in the East Sea in January 1968. For a few days, the internet was awash in stories related to this long-forgotten tragedy. Some described the terrible consequences for the 82 crewmen who were beaten and tortured for almost a year in DPRK prison camps. Other articles attempted to draw lessons from the 1968 crisis that could be applied to today’s situation. Others reminded readers that the DPRK still proudly held the ship, which has become a prominent tourist attraction. But one fairly new and exciting theme in particular echoed across the social media landscape: the idea that the attack had come close to sparking a nuclear war. “U.S. Spy Ship Captured by North Korea almost Caused Nuclear War,” screamed a Newsweek headline. Smithsonian Magazine agreed. “Fifty Years Ago, North Korea Captured an American Ship and Nearly Started a Nuclear War,” blared its headline. CNN took this claim the farthest, with a long piece entitled “How the Seizure of a US Spy Ship by North Korea Nearly Sparked Nuclear War.” The CNN story, proudly noting that it was based on “top secret diplomatic cables; CIA, NSA and State Department reports; and interviews with and testimonies from the crew,” offered maps, photos, and links to documents, and concluded that “US generals were prepared to use nuclear weapons to fight, and could have sucked in both the Soviet Union and China.” It is a powerful and dramatic addition to the story, one that perhaps seems appropriate considering the intrigue that has always surrounded this 177-foot floating Cold War metaphor. There is only one problem, however: the notion that the Pueblo seizure almost sparked a nuclear war is completely wrong. As the days turned into weeks and then months, frustrated American leaders wracked their brains to devise even the most unlikely scenarios that might win the release of the men. Even in desperation, however, no one ever seriously broached the idea of using nuclear weapons. In fact, even the few relatively conservative military steps that the administration did approve, such as building up American naval forces in the area, were taken with great caution and with the central intention of pressuring the North into a diplomatic resolution. Facing an already exhausting war in Vietnam and desperate to prevent the deaths of the 82 crewmen, the Johnson administration left no doubt that it was going to cling to a diplomatic path. “As far as the end of the trail is concerned,” Dean Rusk noted, “the use of military force would make us feel better about it, but does not get our ship and our men back. We do not want to take on a second front if we can avoid it.” Revealingly, when the South Korean military wanted to launch conventional raids against the North in retaliation, American military officials interceded to restrain them, sparking tensions between the two allies. The idea, then, that the administration might have seriously endorsed a nuclear attack when they would not even consider a small ROK retaliation against DPRK ships is simply not reasonable. See, for example, Fox News, “On 50th Anniversary of Capture by North Korea, USS Pueblo crew still feels scars,” January 22, 1968, on-line at: http://www.foxnews.com/us/2018/01/22/on-50th-anniversary-capture-by-north-korea-uss-pueblo-crew-still-feels-scars.html; and the Washington Post, “’Beaten Every Day’: North Korea Tortured USS Pueblo crew members, gathering damaging intel,” January 23, 2018. See, for example, “Lessons From a Spy Ship’s Seizure,” NY Times, January 23, 1968, on-line at: https://www.nytimes.com/2018/01/24/opinion/korea-spy-ship-pueblo.html; Mitchell Lerner, “Remembering the Pueblo: How Internal Imperatives Shape North Korean Decisions,” 38 North, on-line at: http://www.38north.org/2018/01/mlerner012318/. See, for example, “Ill-fated local ship still held hostage by North Korea,” The News Tribune, January 21, 2018, on-line at: http://www.thenewstribune.com/opinion/article195619769.html; and “North Korea Commemorates 50th Anniversary of USS Pueblo Seizure,” USNI News, January 23, 1968, on-line at: https://news.usni.org/2018/01/23/the-uss-pueblo-50-years-later. Tom O’Connor, “U.S. spy ship captured by North Korea almost caused nuclear war and is still there 50 years later,” Newsweek, January 23, 2018, http://www.newsweek.com/us-spy-ship-captured-north-korea-still-floats-fifty-years-788299. 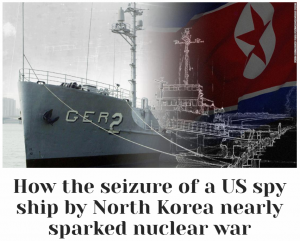 James Griffiths, “How the seizure of a US spy ship by North Korea nearly sparked nuclear war”, CNN, January 20, 2018, http://www.cnn.com/2018/01/20/asia/north-korea-uss-pueblo-intl/index.html. “Tom Johnson’s Notes of Meetings,” Pueblo I, January 23, 1968, 12:58–2:30 p.m, Foreign Relations of the United States, 1964–1968, Volume XXIX, Part 1, Korea, document #213. Johnson Library, National Security File, Files of Bromley Smith, Meeting of Pueblo Group, January 24, 1968, 10:30 a.m., Foreign Relations of the United States, 1964–1968, Volume XXIX, Part 1, Korea, document #217. Report on Meeting of the Advisory Group, January 29, 1968, Foreign Relations of the United States, 1964–1968, Volume XXIX, Part 1, Korea, document #242. “Notes of Meeting,” January 29, 1968, 1:04–1:40 p.m, Foreign Relations of the United States, 1964–1968, Volume XXIX, Part 1, Korea, document #243. See, for example, “Notes of Meeting, January 25, 1968, 6:30–7:45 p.m,” Foreign Relations of the United States, 1964–1968, Volume XXIX, Part 1, Korea, document #226. “Meeting on Pueblo Crisis,” January 24, 1968, 6:00 p.m., Foreign Relations of the United States, 1964–1968, Volume XXIX, Part 1, Korea, document #220. LBJ’s foreign policy is best evaluated in H.W. Brands, The Wages of Globalism (Oxford University Press, 1995). Many of those who push the idea that there was a serious risk of a nuclear conflict cite a memo for the Joint Chiefs from May 1968, which references Operation Freedom Drop and describes it as a “basic outline for planning of a nuclear contingency plan against North Korea.” The whole of the memo, though, makes it clear that the military saw such actions as part of a larger operation to defend against a North Korean attack against the South (as demonstrated by the memo’s title: “Possible Responses to North Korean Attack on the Republic of Korea,” rather than a step to be taken in response to the 4 month old Pueblo crisis). Oral history of Nicholas Katzenbach, Lyndon Johnson Presidential Library, interview #3, p. 4.